Perfect for outdoor use, these Bumper Stickers adhere easily to bumpers and have the strength to withstand a variety of environmental conditions. Great for use on car bumpers, motorcycles, suitcases, bicycles and so much more. So go ahead and hit the streets with your brand, full speed ahead! 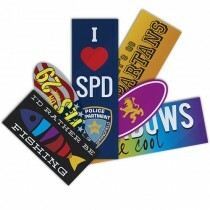 Bumper Stickers can be ordered with Gloss UV Clear Lamination for longer-lasting outdoor durability.